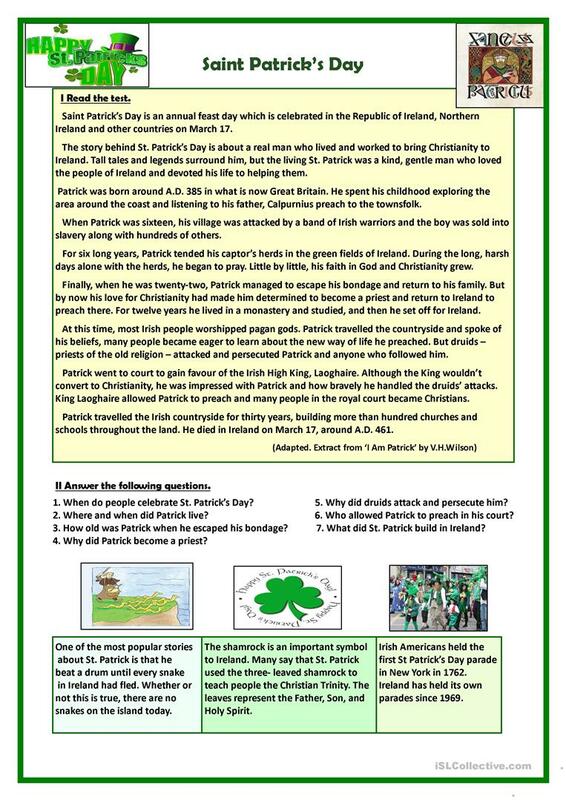 The worksheet can be used as an extra activity when teaching the topic "Saint Patrick's Day". Students read the text, answer the questions and read three facts about this holiday. Hope you find it useful. The above downloadable printable is recommended for high school students and adults at Pre-intermediate (A2), Intermediate (B1) and Upper-intermediate (B2) level. It is valuable for teaching Verb tenses in English. It is focused on the theme of St.Patrick's day. tantana is from/lives in Russia and has been a member of iSLCollective since 2012-11-28 17:09:54. tantana last logged in on 2019-04-19 20:22:36, and has shared 260 resources on iSLCollective so far.